Recently, I came across a wonderful little book, published in 1903 by the South Brooklyn Improvement Association, promoting real estate in the the village. Picturesque South Brooklyn Village has numerous high quality illustrations, so I scanned the vast majority of them, knowing that they'd be useful at some future date. The only ones that I've omitted are small, nondescript landscapes and portraits. At first, my intent was to drive around and photograph all the extant structures illustrated in the book. A lack of available time has made this impossible. Through the use of this map, I've been able to identify the current names of the streets. For the structures that are still standing, I've used the Cleveland GIS to identify the addresses. The biggest surprise has been how many of the buildings pictured in 1903 are no longer standing. More than 75% of the strutcures appear to have been demolished. Many were residences on Pearl Road and Broadview Road, which were demolished to make way for commercial structures. Many of the commercial structures appear to have been removed to make way for new buildings as well. 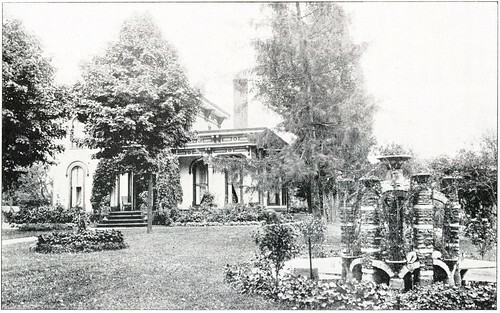 The Italianate style residence of John L. Johnson, on Pearl, was one. 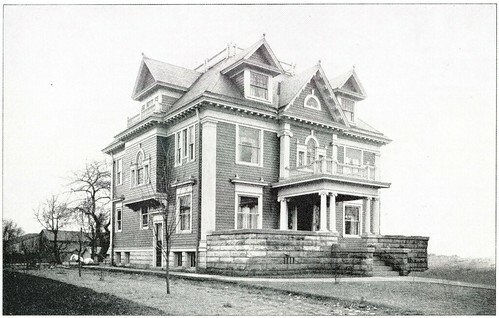 This Second Empire style residence of Charles Gates, also on Pearl, is another example. 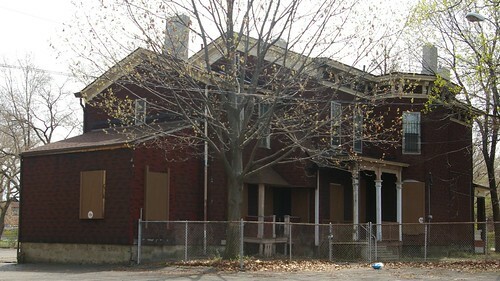 The Howard C. Gates residence, at 4248 West 35th Street, may be more well known than some of the other houses, due to its location next to the Jeremiah Gates residence, thought to be the oldest house in the city of Cleveland. 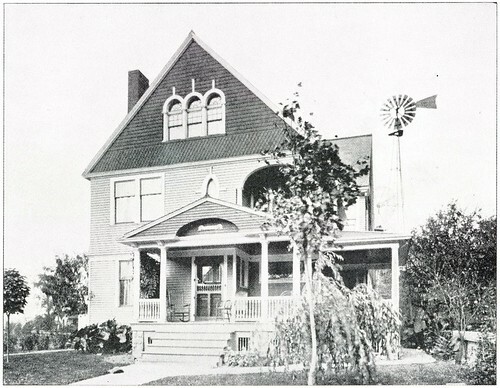 This house, the residence of Dr. H.H. Webster, is another one of my favorites. It, too, alas, has been lost. Note the presence of a windmill in the back yard, presumably to pump water. The William C. Buchwald residence, at 4112 Bucyrus Avenue, is one of my favorites of the lot that is still standing. 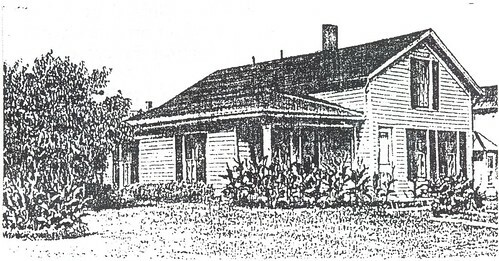 Some of the houses, like the Charles A. Dainz residence, at 3816 Bucyrus Avenue, have been so extensively remodeled that they are hard to identify. Perhaps these photos will be useful for future inhabitants looking to return the buildings to their original glory. I've identified these photos to the best of my ability. Take a look at the set. 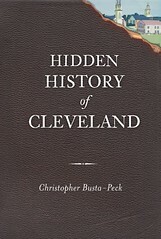 Check out the book from your local Cleveland Public Library branch. If you know of one that I've missed, I'd love to hear about it. I'd also love to see current photos of any of the buildings, if you have them. One of my big complaints about books and other publications dealing with history is that there's too much gray text and what few illustrations there are, are in black and white. Vibrant imagery helps draw the reader into the narrative. Imagine my surprise when I came across this painting of Public Square, in downtown Cleveland, in 1839, at the Western Reserve Historical Society. I don't recall, in print, any color images of Cleveland from the 19th century. I was stunned when I found this 1873 print of Public Square. We need color images to better illustrate the historical narrative. While cost may have been an issue in print, it isn't on the web. I've seen this image reproduced in black and white before. I don't believe it's ever been reproduced in color. [Ed note (July 13, 2010): The painting was reproduced in color in Transformations in Cleveland Art, 1796-1946.] 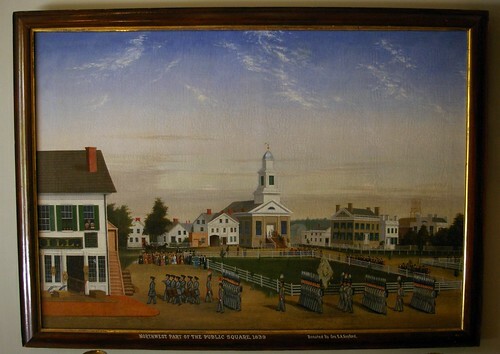 Further, next to it was another oil painting of Public Square, from the 1850s. Alas, my photograph of it did not turn out well enough to share. The scene, of the northwest corner of Public Square, was painted by Joseph Parker in 1839. It features the Cleveland Grays. It is more notable, however, for the depiction of the area. The church in the center is the First Presbyterian Church. The Old Stone Church would be built later on the site by the same congregation. This painting provides an excellent illustration of what the center of Cleveland looked like 170 years ago. It shares much with the New England culture that created it. I knew there was something interesting about this house, at 4400 Turney Road, in Cleveland, Ohio, but I couldn't quite place what it was. I came across the answer in Recollections: A Collection of Histories and Memories of Garfield Heights, published by the Garfield Heights Historical Society in 2003. This house, built c. 1850. was the residence of Thomas Garfield from 1850 and 1873. Garfield was the uncle of president James A. Garfield. In Recollections (page 10), Dan Ostrowski states "James Garfield spent a great deal of time at his uncles home during his studies at Hiram [College] and most likely during his one season job on the Ohio and Erie Canal." Garfield was a student at Hiram College from 1851-1854. 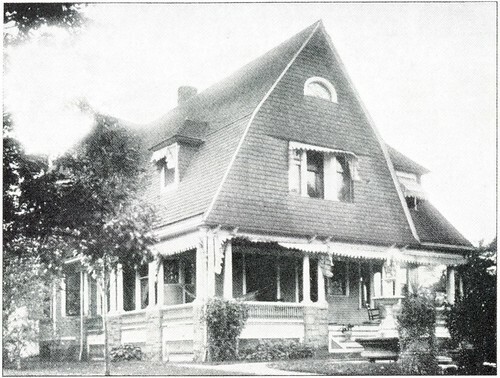 This historic photograph, published on page 10 of Recollections, gives us a way to visualize how the house has changed over time. 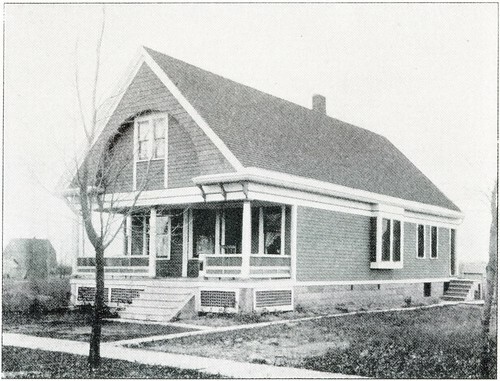 It was common for a house to have two front doors. 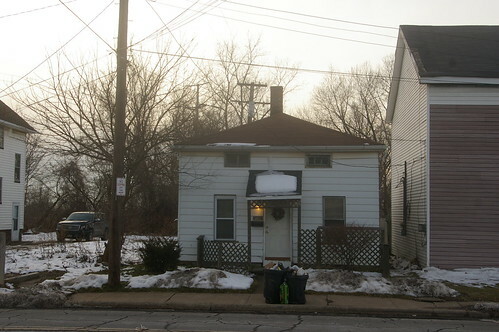 The one closer to the street, now covered by vinyl siding, might still be present. 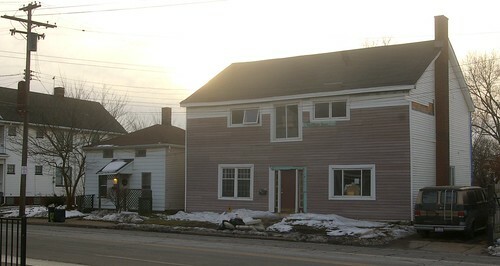 Likewise, the missing window to the rear of the house might just be hidden under the vinyl siding. If so, this would provide a future owner the information that they need to replicate the missing windows. It's things like this that firmly cement my belief that history isn't something that happens elsewhere, on grand avenues and in great buildings. History is something that happens right here, in our neighborhoods, on the streets that we walk every day. One of the most interesting, most impressive houses that we saw during our search was this one, at 3170 Ludlow, in Shaker Heights, Ohio. 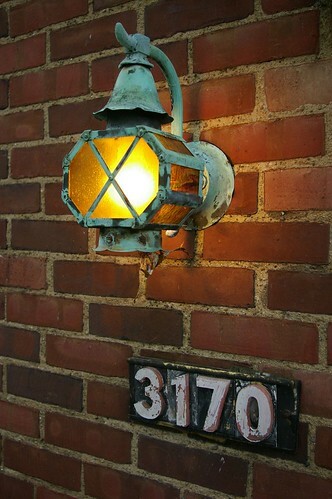 On the exterior, it appeared like an ordinary late 1920s brick Tudor Revival style home. There were aluminum awnings over the windows, which have since been removed, and shrubs that took up a bit too much of the yard. The price was about right, and it looked interesting, so we thought we'd take a look. The layout of the interior was what we might expect for a house of this vintage in this area, but the way it was finished, oh! 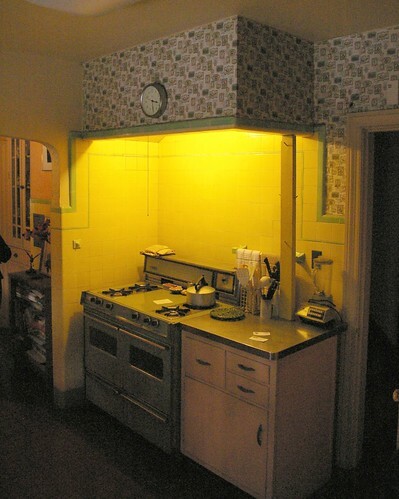 The kitchen was tiled in yellow with green accents. The massive hood, built for the original gas range remained. There are some who will express a strong dislike for the wallpaper. I agree. Wallpaper, one must remember, can be changed easily ehough without affecting the fabric of the house. The tile continued around the kitchen. The top cabinet shown here is original, while the bottom one is a later replacement, in the original location. The tile continued to the right, into the icebox nook. 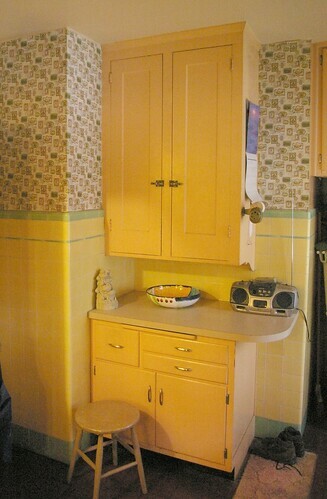 The breakfast nook, which featured this nice built-in cabinet, was also tiled. The rest of the first floor was much as we had expected. 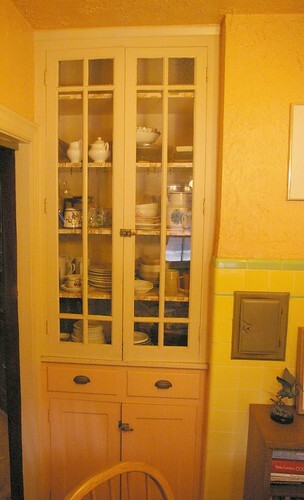 The dining room included two nice built-in cabinets with leaded glass in their doors. The stairs to the second floor featured a simple, almost art deco wrought iron railing. One especially nice feature I noticed on the first floor, which continued throughout the house, involved the windows. The windows were wood casements, meaning that they swing out rather than sliding up and down. Screens and storm windows are usually mounted on the inside. As a result, you have to remove the screens to open or close the windows. This was not the case with this house. Each screen had a small hole at the bottom through which a crank could be fit. With the crank in place, you could open or close the window without having to undo the various bits of hardware holding the screen in place. Then I saw the first floor bathroom. The bathroom features purple and green tile. Even the floor has purple and green tile. While not original, the current sink fits into the space nicely. I haven't seen a 1920s sink that would work as well as this one does in a bathroom this size. On the second floor, it got even better. 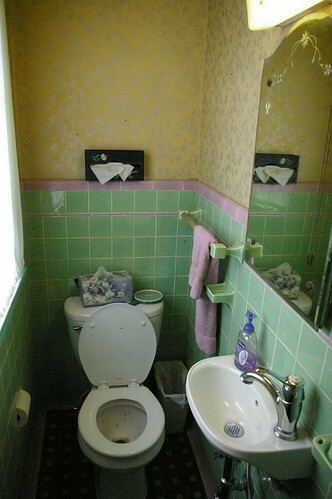 Both bathrooms were tiled in pink and green. 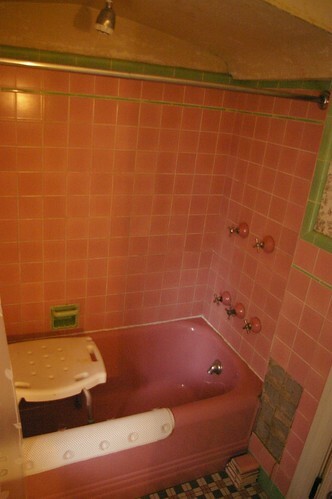 Even the tub in one bathroom was pink! While one of the sinks and both of the toilets on the second floor were replaced, I doubt that they too were pink originally. This sink is period-correct and likely original. As it is white, it suggests that the other sink and toilets were originally white, too. Pink toilets and sinks were available, as were many other colors. The colors of the tile would stand out even more if the wallpaper was removed and the walls painted a good color. I'm not sure what that color would be. My inclination is white, but I'm inclined to paint everything white, so take that for what you will. I hope that this helps illustrate that 1920s and 1930s bathrooms color choices were not limited to white, white, and white. 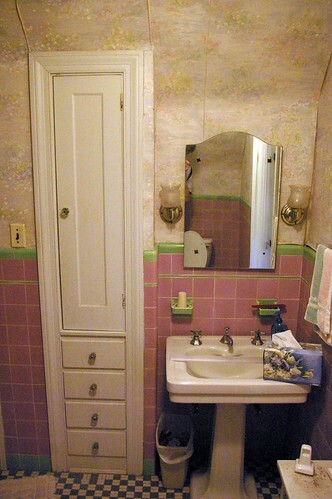 The dominance of white as the bathroom color of choice ended in the early 1920s. A wide variety of colors became available, both with regard to tile as well as fixtures. Even massive drainboard sinks were available in a variety of colors (here's one example), though white remained most popular. I admit that these colors aren't for everyone. If you have a bathroom or kitchen like this, I strongly encourage you to retain it. Colored bathroom fixtures are hard to find and tend to be very expensive when they do show up. If you're going to get rid of them, please let me know and I'll offer them up to the readers - I'm sure there will be many people eager to give them a good home. 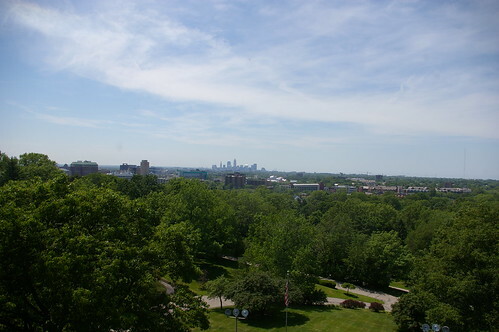 The neighborhood around Cleveland Museum of Art, Case Western Reserve University, the Cleveland Institute of Music, and the Cleveland Museum of Natural History is known as University Circle. For a long time, perhaps longer than I should admit, I thought that the circle the name referred to was the one made by Wade Oval, the road that runs in front of the art and natural history museums, and the Cleveland Botanical Gardens. There was a certain logic to this - after all, it is the only reasonably circular road in the University Circle area. Alas, this was not true. University Circle, which eventually gave name to the whole neighborhood, was a traffic circle, located at approximately Euclid Avenue and Stearns Road. This plate, from the 1898 Atlas of the city of Cleveland, Ohio illustrates the University Circle area. The actual circle can be seen just to the right of center. The circle lasted at least into the 1950s. As roads were realigned, the circle was eliminated. 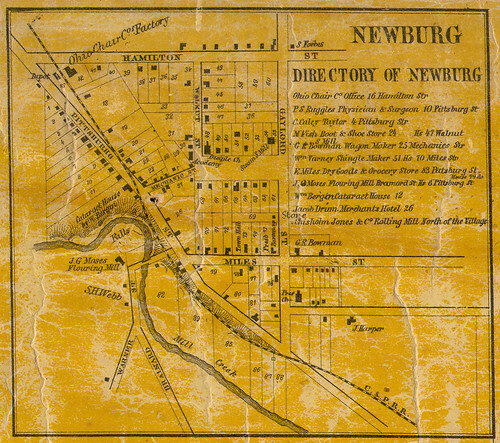 This map is just one of the many great research sources available online thanks to the Cleveland Public Library maps collection. The other day, while I was trying to identify the architect for this house, at 2226 Chestnut Hills Drive, in Cleveland Heights, Ohio, I came across a great resource: the Cleveland Heights Heritage Home Tour. 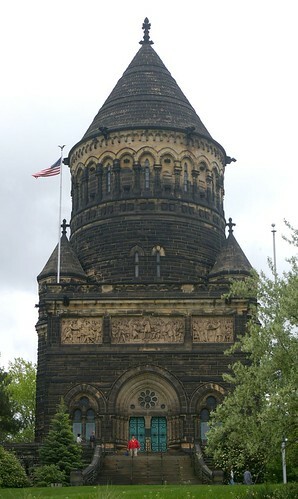 The tour is a project of the Cleveland Heights Historical Society, which has run the tour annually since 1977. 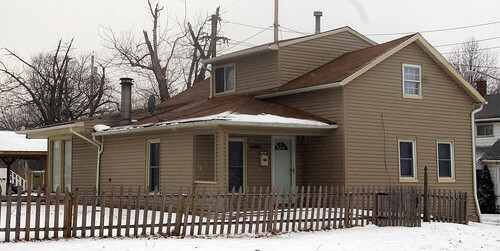 The website includes 229 homes. One may sort by street, year of construction, and year that the house appeared on the tour. Each entry includes a considerable amount of background information about the house. 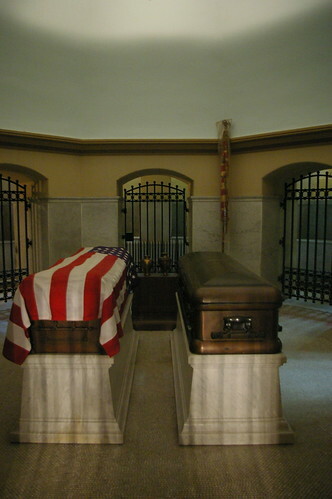 This includes the architects who designed the structures and the families who commissioned them. Further, the entries usually describe the interior, which is especially useful, as most sources tend to focus on the exteriors of these historic buildings. It's worth noting, as the above photograph suggests, that the home tour includes both historic and contemporary architecture of interest. 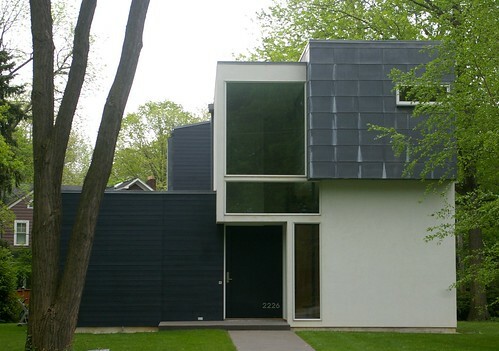 I learned, thanks to the database, that this house, built in 2005, was designed by architect Thom Stauffer. It's worth noting that the house was also featured in the 2007 Cleveland Artists Foundation exhibit Cleveland Goes Modern. This brochure on Cleveland Heights Landmarks may also be of interest. It provides a brief overview of some of the most interesting structures in the city, including many commerical and religious structures not included in the tour. 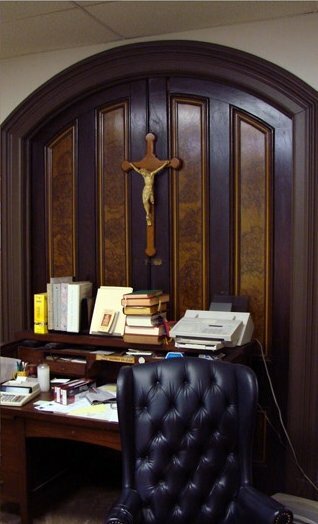 A little while ago, I expounded the virtues of one of the properties being offered for sale by the Diocese of Cleveland - St. George's Lithuanian Church and rectory. 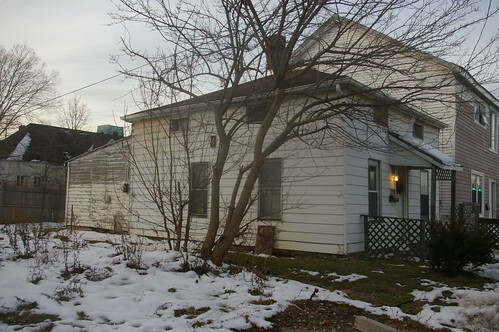 The property, at 6527 Superior Avenue in Cleveland, consists of 2.75 acre lot with three buildings. 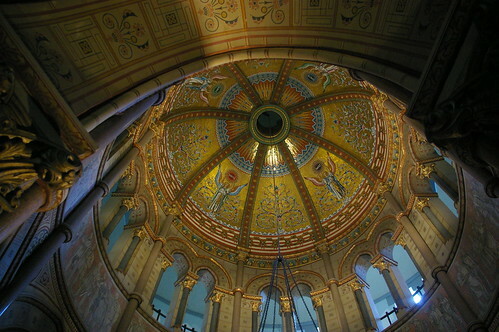 The main structure is a 40,000 square foot church and school, built in 1920 to plans by architect J. Ellsworth Potter. There is also a 4+ car garage and a rectory. 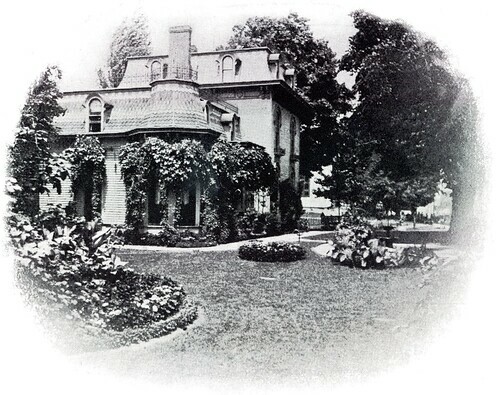 The rectory, known as the Beckenbach residence, was built for Henry and Catherine Beckenbach between 1874 and 1881. It remained in their family until it was sold to the Diocese of Cleveland in 1917. The 5,000 square foot house appeared to have good lines. 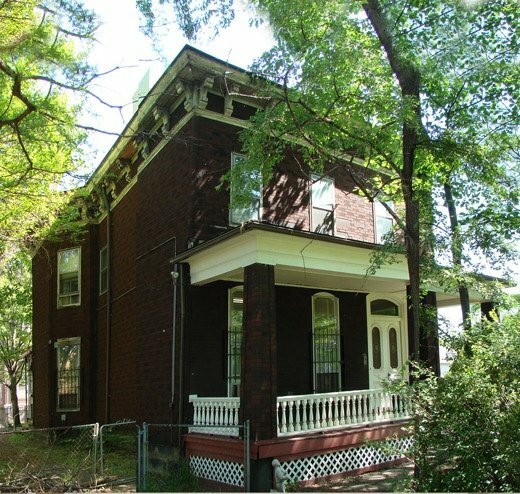 I tried to make the case that I doubted there would ever be another house in the city this old available at this price point with all of the land originally associated with it. Given my use of this exterior photograph, my case may have been less than persuasive. I assumed that the interior was in decent condition, as it had been in use by the church until recently, but I assumed that it had likely changed considerably over the years. Imagine my surprise when Tim Barrett told me that he had had a chance to see the house last June, before it was boarded up. Note the beautiful front door in the first picture. 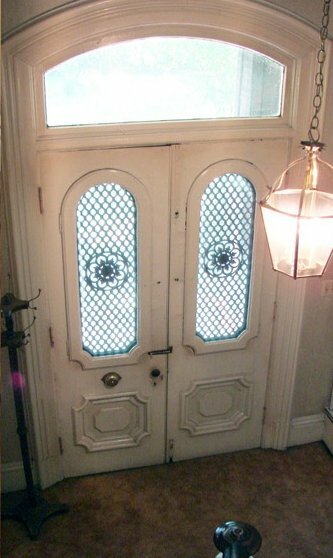 This image illustrates the door as seen from the inside of the house. 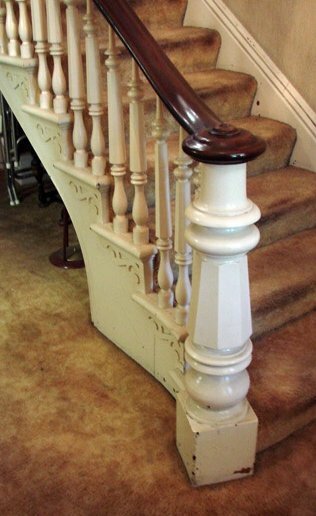 A beautifully detailed railing curves out into the main hallway, leading one up to the second floor. 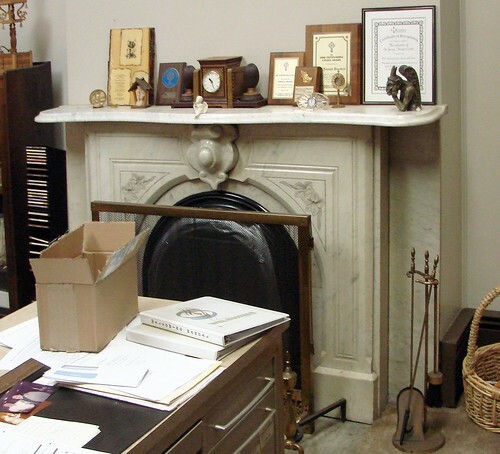 This is one of three fireplaces that serve the house. 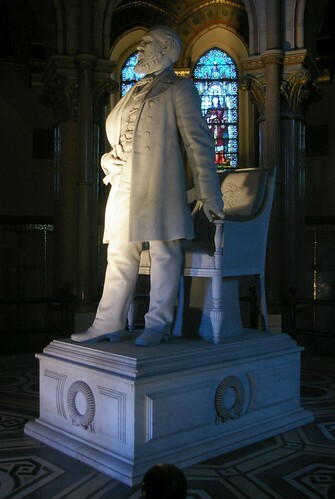 Note the detail in the marble. A pair of pocket doors feature a faux walnut burl finish. The dark wood trim, probably walnut, continues through the rest of the house. You might notice a dropped ceiling in this photograph - I suspect that once this is removed, elaborate crown mouldings will be revealed. Overall, the interior of this house is in much better condition than I might have expected. Get rid of the carpet and the ugly dropped ceilings, add some paint, and the interior of the house might again be stunning. Yes, the present aesthetics of the exterior of the house do leave a bit to be desired. However, it doesn't appear that much damage was done to the it in the installation of the imitation brick shingles. It should be easy enough to remove, revealing the wood siding underneath. 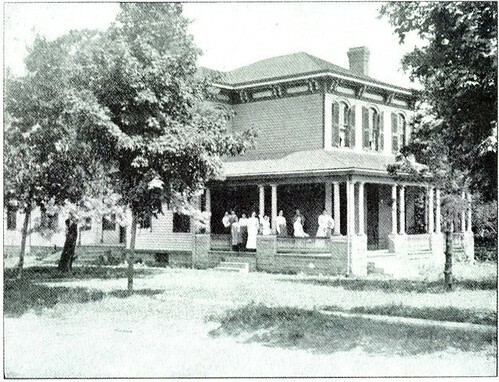 The house would benefit from the removal of the front porch, which was added in the 1910s. The side porches should remain, as they appear original, though the form of the one on the east side may have been changed over time. Securing the property seems to have been a concern, given the presence of the window bars. My suggestion would be to commission a local artist, perhaps Brinsley Tyrrell to create wrought iron window bars that were more suited to the house. The Beckenbach residence is directly across the street from what I've called the best frame Italianate house in the city. Look at some of the photographs of that house and imagine what a pair these two could be, telling some small part of the narrative of the history of this neighborhood. 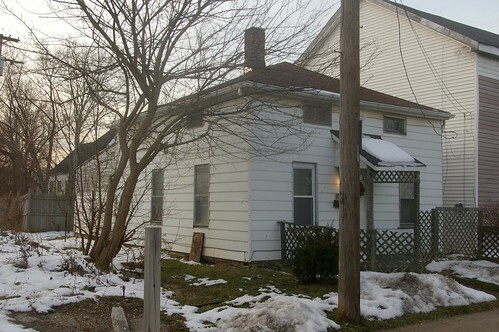 This house and church are still being offered for sale at $175,000. They are both landmarks within this neighborhood that cannot afford to be lost. 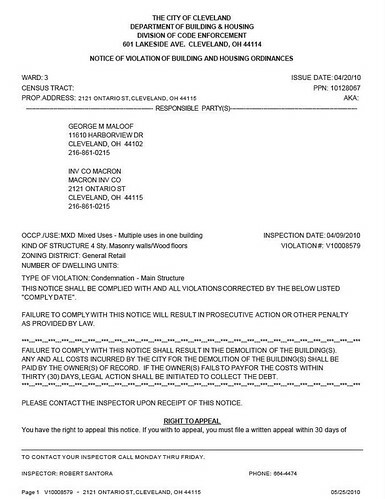 Last week, I learned that this building, at 2121 Ontario Street, has been condemned. It's on the east side of the street, between Prospect and High. Known as the Stanley Block, it was built circa 1874. It is one of a few stone-faced commercial buildings of this vintage still standing in Cleveland. The Stanley Block has had an interesting history, due partially to the ballroom on its top floor, where many meetings and events were held. I'd hoped to write a comprehensive history of these, but I haven't had the time, and the urgent nature of this cause requires that I publish what I can now. All citations, unless noted otherwise, are for the Plain Dealer. 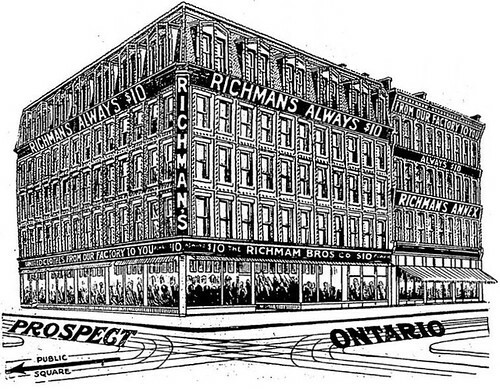 This block, located at 174, 176, and 178 Ontario by the pre-1905 street numbering system (2115, 2119, and 2121 Ontario by the post-1905 system) was probably built 1874 (Herrick, Cleveland Landmarks, page 160) and definitely in the 1870s for one G. A. Stanley. I have not yet learned anything else about Mr. Stanley. Other events include a "Cleveland Gesangverein concert", (November 11, 1880, page 4), the Young Men's Hebrew Association ball (December 6, 1880, page 4), the Austin Post 403, G.A.R. grand militiary ball and concert (October 5, 1884, page 4), and the ball of O.D.I.F. Sahbele lodge 6, with music by Professor Straube's orchestra (February 13, 1887, page 5). In 1888, the Ancient Order of Hibernians held their county meeting at the hall (August 6, 1888, page 8). They obtained a five year lease on the hall, which was to be overhauled and would become known as Hiberian Hall (April 29, 1889, page 8). From this point on, the hall began to be used for more significant meetings. General William Thomas Clark, national commander of the Union Veterans' Union, was presented with an elegant silk flag by Justice command, No. 3. (May 22, 1890, page 8). The hall was used for meetings by a wide variety of labor unions. The barbers union met several times, both for general meetings (June 17, 1890, page 8) and with regard to the arrests of those who worked on Sundays (July 1, 1890, page 2 and July 8, 1890, page 6). In 1891, the Central Labor Union began meeting at Hiberian hall (February 17, 1891, page 8). Samuel Gompers, founder of the American Federation of Labor gave a free speech on Sunday, February 8, 1891, at 2:30 pm. (February 7, 1891, page 3). These meetings became more political, as indicated by a joint meeting of the Nationalists, the Knights of Labor, and the "adherents of the citizen's movement", with regard to the alleged Republican forgery of votes. (April 6, 1891, page 8). 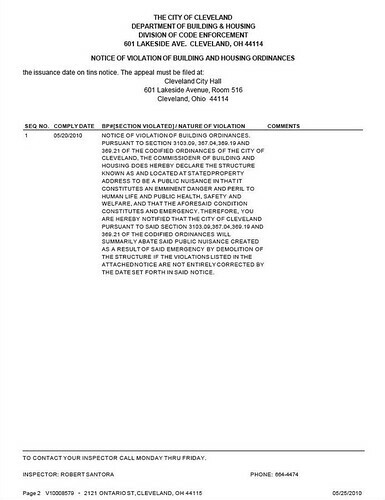 A noticed for a Central Labor Union meeting noted that Robert Bandlow would be lecturing at the next meeting. (April 17, 1891, page 2) The Hod Carriers met here, hoping to secure $2/day wages (May 11, 1891, page 8), and went on strike to that end (May 15, 1891, page 2), using the hall as their headquarters. At this time, one begins to see more ads for businesses using the first floor retail space. 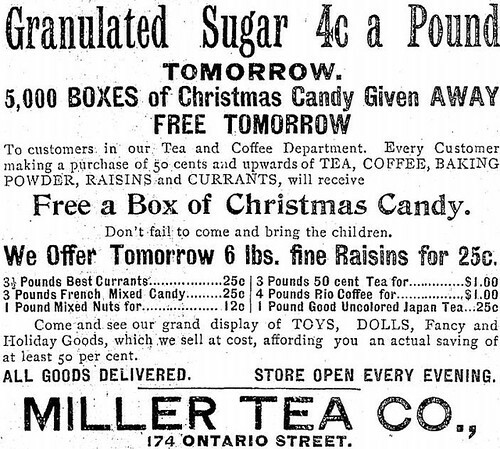 This one, for the Miller Tea Co. (April 9, 1893, page 1) is one example. In 1895, P. J. McGuire, national secretary and treasurer of Carpenters' union and first vice president of AFL spoke to an open meeting of the Carpenter's union. 400 peresons were said to be president. At the time, we note a change in the name of the venue, to Blahd and Heller's hall. (May 8, 1895, page 2) After this, we don't see many notices regarding the meetings of labor unions at the hall. By 1924, the entire first floor was occupied by a Woolworth's 5 and 10. This photo, also from 1924, shows the Stanley Block, in the center of the image, in historical context with the surrounding buildings, now lost. A few years later, in 1928, the Woolworths had been replaced by C-T Lunch, Factory Outlet Shoes, and Belkin's Men's Furnishings. Clay Herrick, Jr., notes the significance of this building in Cleveland Landmarks, where he devotes a full two pages to the structure. He states that the ballroom here was where Frances Payne Bolton, among others, made her debut. He further notes that when, in 1981, the Cleveland Landmarks Commission asked the Cleveland Chapter of the American Institute of Architects to select several buildings for restoration that this one one of them. The Stanley Block (permanent parcel 101-28-067) has been owned since at least 1975 by George M. Maloof or, more recently, by the Macron Investment Co. 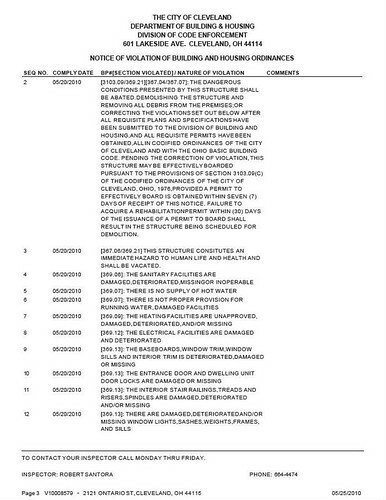 The Ohio Secretary of State's Business Filings database reveals Maloof as the contact agent, and his home address as the contact address. Macron and Maloof do not appear appear to have been good stewards of this piece of our history. It is shameful that it has taken this long for the neglect of the structure to come to the public light. 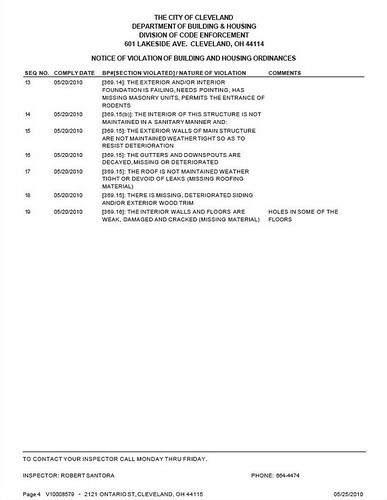 One might guess, based on the lack of care given to the structure thus far, that the condemnation will not be fought. The taxable value of the property as vacant land is far smaller than as a commercial structure. If demolished, it will likely sit as surface parking until it can be redeveloped. This is a beautiful old building, with a great history, both in society and organized labor. 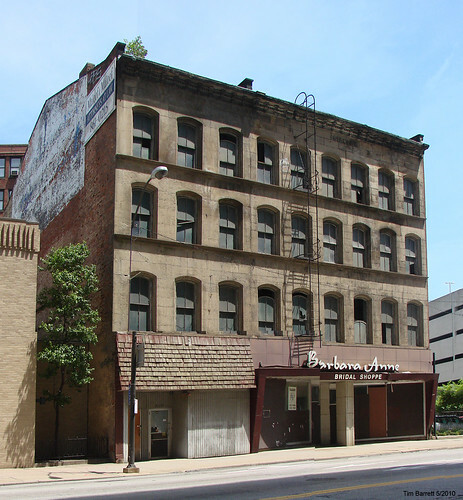 There are very few stone-faced commercial buildings of this vintage left in Cleveland. It appears to be a solid shell that could be rehabilitated without excessive costs. We simply cannot allow it to be demolished because the owner has failed maintain it. The owner must be held accountable for this wanton neglect. 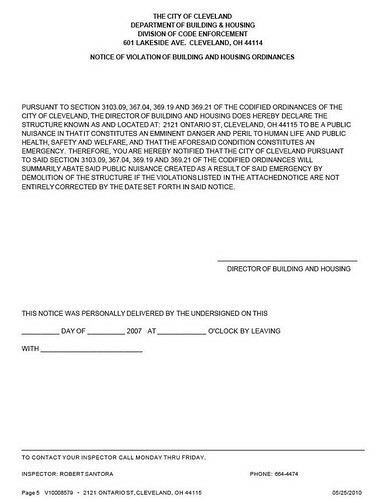 I encourage you to contact the Cleveland Department of Building and Housing and Joe Cimperman, city council member for Ward 3, where the Stanley Block is located. Let them know that you feel this structure must be preserved, even if the owner would prefer it be demolished.